Save on Home and Garden Items from Amazon. Slurp! Slurp! Spaghetti with sauce is a super family supper. It’s surely a favorite in my house, and it’s easy to make in a hurry. Here’s a big bundle of spaghetti recipes I’d like to try, published by a heaping helping of food writers. 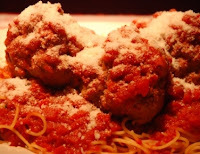 There is nothing like Homemade Spaghetti and Meatballs to please the palate and tickle the senses. Add to that a specially seasoned sauce, a loaf of garlic bread, and a fresh salad you have a homemade meal fit for a king. When it comes to Italian food, spaghetti with meat sauce is one of America's favorite dishes. The combination of rich tomato sauce with ground beef and pasta is comfort food at its finest. How healthy is this dish though, especially when you consider that many of us use store-bought sauces? Here’s how to make spaghetti with meat sauce into a nutritious and healthy meal. This recipe came about when an exhausted mom was in a frenzy, trying to put together a healthy meal for her family. She looked in the kitchen cupboard and found a box of pasta and a jar of marinara sauce. But she wanted to make sure her family was getting protein and extra veggies. She opened the freezer, glanced around, and voila! Everyone knows how to cook spaghetti...right? Wrong. Do your noodles come out as mushy as the food you feed your baby? Please don't tell me they instead look like a bird's nest, all sticky and weaved together. Spaghetti noodles should be soft, but not so soft you'd mistake them for mush. If there were no other interesting and enjoyable attractions in New Orleans (and there are hundreds), finding and understanding spaghetti with fresh Cajun tomato sauce would make a trip to the Crescent City worth the effort. Garlic lovers delight! This delicious homemade spaghetti sauce includes sautéed onion, garlic and spices. The meatloaf includes more garlic, along with mushroom soup, bread crumbs and spices. If you are looking for a quick and easy meal to make for dinner, Chili Spaghetti is just what you need. It is the perfect meal for a cold night. Who’s hungry for some fresh spaghetti? Feel free to follow on GooglePlus and Twitter. You are also invited to join this writer's fan page, as well as the Chicago Etiquette Examiner, Madison Holidays Examiner, Equestrian Examiner and Madison Equestrian Examiner on Facebook. 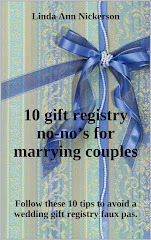 This micro-eBook offers 10 tips for avoiding a wedding gift registry faux pas. Available on Amazon Kindle. 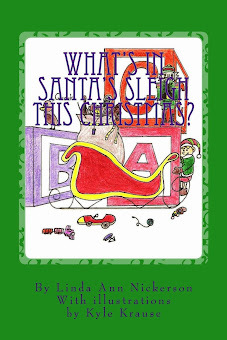 What's in Santa's Sleigh This Christmas? What if we could peek inside the windows of Santa's magical North Pole workshop? Do you think we might catch the elves in action, trying out each wonderful new toy before they load the sleigh and hitch up the reindeer? This playful holiday story explores such a scenario with singsong read-aloud rhyme by an award-winning writer, accompanied by wonderfully whimsical sketches by a talented young artist. Flipping Out Over Holiday Returns? Removing gummy glue from recycled jars is easy and harmless. O is for Oh, No! Osteoporosis! NOTE ABOUT POSSIBLE BROKEN LINKS: This blogger has written for a variety of websites for many years. A few of those sites (such as Examiner, Helium, and Yahoo Voices) no longer exist. Older blog posts may contain links to some of those sites. Please accept the blogger's apologies for old links that may no longer work. NOTE ABOUT ADS ON THIS SITE: Many of the promotions displayed on this blog are generated automatically by advertisers. Political, ideological, and other views expressed in such placements are not necessarily those of the site owner. Appearance here does not necessarily construe assent or endorsement. Practically at Home is Copyrighted. It is illegal to copy, reprint or republish any items on this site without the author's permission. Reprints may be available upon request from the author. NOTE: Inclusion of books, products, or professional services in advertisements on this site does not necessarily imply endorsement of such. Find my Kindle books on Amazon. Follow Holidays Examiner - Madison and More on Facebook. Reference herein to any specific commercial products, processes, or services by trade name, trademark, manufacturer, or otherwise, does not necessarily constitute or imply endorsement, recommendation, or guarantee by this website or its publisher. Practically at Home is rated "G."